Bulbs sometimes clustered, globose, 1-3 cm diam. Leaves 3-11, 2-6 dm × 5-20 mm. Inflorescences 27-87 cm; sterile bracts 3-19(-28), bracts subtending flowers shorter than or equaling pedicel. Flowers actinomorphic; tepals withering separately, sometimes connivent over capsules, light blue to lavender, each 3- or 5-veined, 6-10 × 2.2-3.6 mm; anthers bright yellow, 1.5-2 mm; fruiting pedicel incurving-erect, 6-12 mm. Capsules deciduous, pale green to light brown, ovoid-ellipsoid, 6-10 mm. Seeds 2-5 per locule. 2n = 30. Flowering mid--late spring. Prairies; 100--500 m; Ark., Ill., Ind., Iowa, Kans., Mo., Okla., Tex. 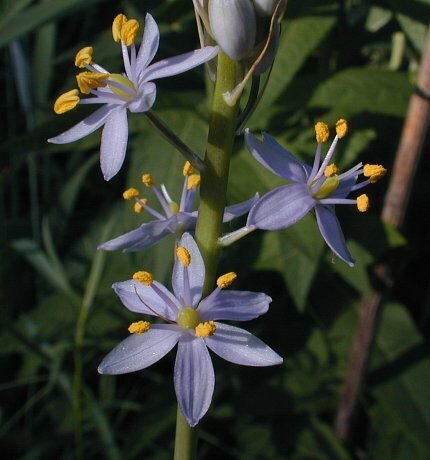 Camassia angusta flowers two to three weeks later than sympatric populations of C. scilloides.